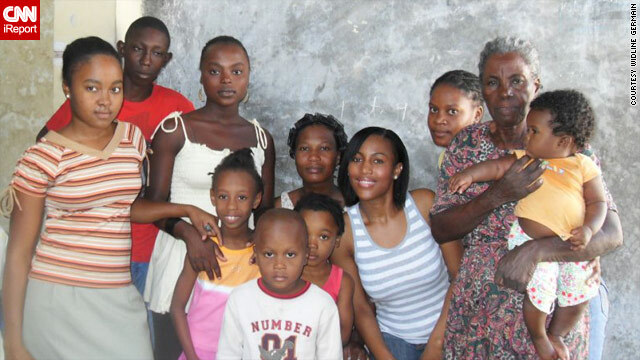 Widline Germain, in blue striped top, and her relatives in Haiti a few days before the earthquake. (CNN) -- The list of relatives Widline Germain has not heard from since Haiti's earthquake seems like a town population in itself. "When you count our extended family -- the dozens of cousins and aunts and uncles -- there's several hundred of us in Haiti, and we don't know where most of them are," she said from her home in Binghamton, New York. On January 11, the day before the magnitude-7.0 earthquake hit, the 25-year-old who recently graduated from SUNY Cortland returned to New York from an extended New Year's holiday in Haiti. Drawing attention to a photo of the Haitian presidential palace lit up with Christmas lights, a tree decorated on its grounds, she said, "It's like I'm stuck in a horrible dream. The bed I was sleeping in the day before the earthquake is dust." On Thursday, Germain went through the names of relatives -- she says she has about 400 in Haiti -- whom she and her parents are searching for and whom they know are gone. Elise and Benson Germain and their son Junior Germain, missing. Marie Nerla Nicolas and Wilkense Nicolas, missing. "I lost a cousin on my father's side. My mother lost her sister and all four kids," she said. "There are 10 missing on my mother's side and eight missing on father's side." She described a mentally disabled uncle who reported being attacked by thugs in Port-au-Prince. Many of her family members live in Jérémie, a river town of about 31,000 that is largely isolated from the rest of the country. "The ones in Jérémie, I don't think most rescuers are getting to the smaller towns," she said, pausing. "All my little cousins -- like ages 2 to 7 -- how are they ever going to be able to get over walking over dead bodies in the street? "They were telling us on their cell phones that they don't have water. They have nothing," Germain said. "We are here, and we can't do anything for them. My family is there starving and thirsty, sleeping on the street -- elderly people sleeping on the street -- and I'm here with water and food. I can't stand this. It's wrong." She and her father and their extended family in New York are prepared to take everyone in. "It's going to be hard, but we have college degrees, jobs, a big house," she said. "We're going to manage, because they're family, and that's what you do."